Euro Games Technology, also known as EGT, is a leading gaming manufacturer. The company has it’s headquarters in Bulgaria, and was founded in 2012 when they launched their first ever game – Gladiator. Within two years they participated in their first gaming exhibition in Moscow. After first expanding in east Europe, they made their debut in the gaming walhalla Las Vegas in 2008. Now, EGT is an expert in the creating, producing and distributing of both land-based and online games all over the world. 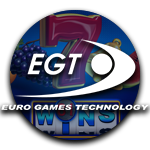 EGT offers a large variation of games and solutions divided in 4 major categories: Games, Multiplayer, Interactive and Systems. We’ll provide a brief explanation on all four categories, focusing mainly on the interactive product. Like most gaming manufacturers EGT’s roots lie with land-based casino games. Jackpot games such as 3 happy hits and Fu Gui Rong Hua (both local progressive games) are on their list of creations. An example of a cabinet they created is the Super Premier cabinet, which has two landscape curved monitors, LED illumination and an enhanced stereo sound system. Euro Games Technology also produces several multiplayer tables which can often be found in land-based casinos, but are also used for live casino portals online. Examples are the Luxury 84″ live touch table which counts one roulette wheel and 6 seats, and the Rigel series which combines video slots and roulette games with a progressive jackpot system – Jackpot Cards, which will be further explained below. European Roulette – an automated European Roulette game. It uses real-time video streaming to prevent any delays. 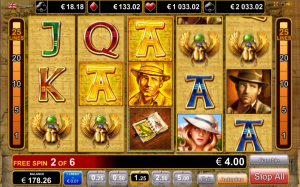 The game has a detailed statistic screen and offers re-bet, double and re-double functionalities. 40 super hot – This is one of the many popular Hot games that EGT has placed on the market. 40 Super Hot is a classic slot with 5 reels and 4 reel positions. Joker Poker – a table game played with one deck of 52 cards + Joker. To start the game you have to click the DEAL button, after which you can hold any of the five cards. By clicking on the DRAW button you’ll deal the final hand and replace discarded cards with news cards. Keno Universe – This Keno game has a table capacity of 80 players and offers multi-denomination and Auto-play functionalities. Jackpot – EGT uses a multilevel system: mystery Jackpot. We love this system as it has four Jackpots which are displayed at the top of the slot. They all correspond to a card suit and vary in amount. The jackpots are displayed from low (left) to high (right). They can be won in the Jackpot Cards Mystery Bonus round which is randomly triggered after a game is finished. Once triggered a field with 12 playing cards, all face-down, will appear. You then have to pick cards by clicking on them and will continue until 3 matching card suit symbols are revealed. You’ll receive the jackpot corresponding with the revealed suit. EGT has three system solutions which they offer to operators: Video Lottery Terminals (VLT), Octopus Server Based Gaming (SBG), and Spider Casino Management System (CMS). We won’t discuss them too much but will still give a quick summary. VLT connects an unlimited amount of locations to one central server. This system allows easy monitoring and control of all gaming terminals in the network which makes it very adaptable to all sorts or updates and requirements. SBG allows clients to separate content and games from physical terminals as it provides operators with downloadable gaming content, which can decrease costs. CMS lends a helping hand with casino management tasks. Ever since they launched their company EGT has always had a clear vision: “..to serve our clients worldwide with state of the art quality gaming entertainment and high level of customer care and service”. Staying true to this vision has contributed in their rapid growth which can clearly be seen in the results they’ve booked over the years. They have been investing a lot to adapt to regulated markets. Earlier this year for example their interactive branche obtained several gaming licenses in Romania, which cover both the production and distribution of gaming software. EGT is clearly a big player and we expect to see them expand much more over the upcoming few years.